I’ve had such a fun weekend! 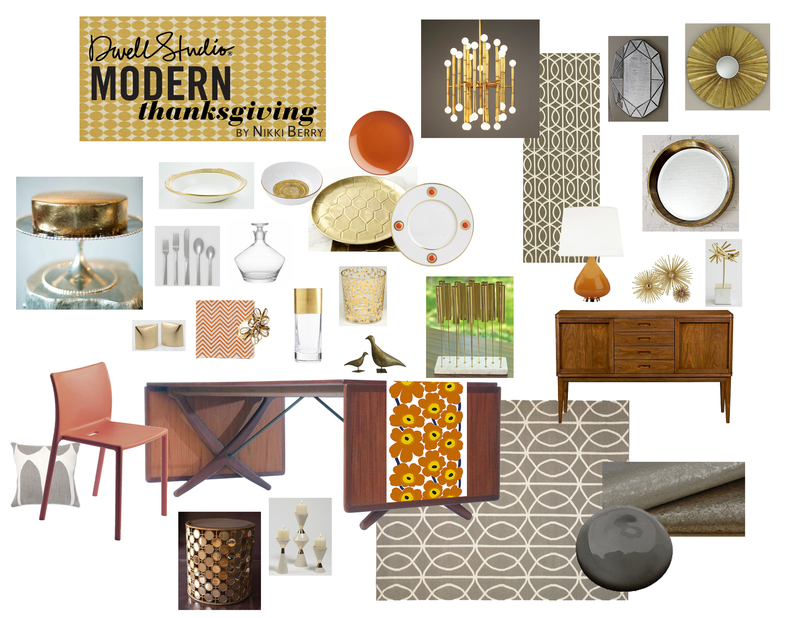 I have shopped for my dream Thanksgiving table as part of a contest for Dwell Studio. By using Pinterest, My Modern Thanksgiving board was easy to pull together through my favorite online retailers. But I couldn’t just stop at the tabletop….I designed the entire dining room! My design started with two favorite pieces from my personal collection: Orange Air Chairs from Jasper Morrison & Marimekko Unikko print fabric. From there my inspiration was vintage Scandinavian design and gold tones. Add it all together and it equals a beautiful dining room that is Modern yet speaks of vintage uniqueness. Each piece is carefully selected to balanced in the room based on its shape, color and style significance. My choices are a mixture of highs and lows and I tried to stay off the beaten path of mainstream resources, maybe you’ll see a store that you didn’t know about or havent thought about shopping from before. Some of the items I own, some are on my wish list and some are on my “in my dreams” list. There are more than 35 items and I invite you to view my Pinterest board here for product resources. If you aren’t on Pinterest, you are missing out on the latest design tool and social obsession, give it a try! If you have a closer look at my selections I’ll walk you through why it all works nicely together. While it looks like a room that took years for someone to collect items they love individually (& I do love each item!) there are a few common elements that pull it together. First of all the colors orange and gold compliment each other in many tones and ranges from bright orange & rust to shiny brass & antiqued gold. Since I gave the core of the room a grounded warm gray, those colors have a nice canvas to stand out on. Then there are the repetitive shapes: the linear chandelier and centerpiece, the starburst mirror and tubular objects and the triangular facets in the mirror, short glasses, candlesticks & silverware. Relating elements in a room gives your eye a reason to search out and find details. It’s a pleasing feeling to find that each piece is there for a reason, its how an “undecorated” room has purpose yet the style is still personal. Enjoy my design and check in at the Dwell Studio Blog to see who inspires me and how the contest turns out. A big thank you to Dwell Studio for hosting this contest, it was a fun & easy challenge to take part in and the prize offerings are very generous!